(CNN) A couple was arrested after police discovered that their 13 children had been held captive in their California home in filthy conditions, some shackled to beds with chains and padlocks, officials said Monday. The victims ranged in age from 2 to 29, the Riverside County Sheriff’s Department said in a statement. A 17-year-old girl managed to escape from the residence in Perris, California, on Sunday and called 911 from a cell phone she found in the house, police said. The girl claimed her 12 brothers and sisters were being held captive inside the home by her parents, some of them bound with chains and padlocks, the Riverside County Sheriff’s Department said. The 17-year-old “appeared to be only 10 years old and slightly emaciated,” the Riverside Sheriff’s Department said. Sheriff’s deputies responded to the home and found the 12 other victims, who “appeared malnourished and very dirty,” authorities said. All of them looked like children, police said, and officers were surprised to learn that seven of them were adults. Several were shackled to their beds “in dark and foul-smelling surroundings,” the sheriff’s department said. 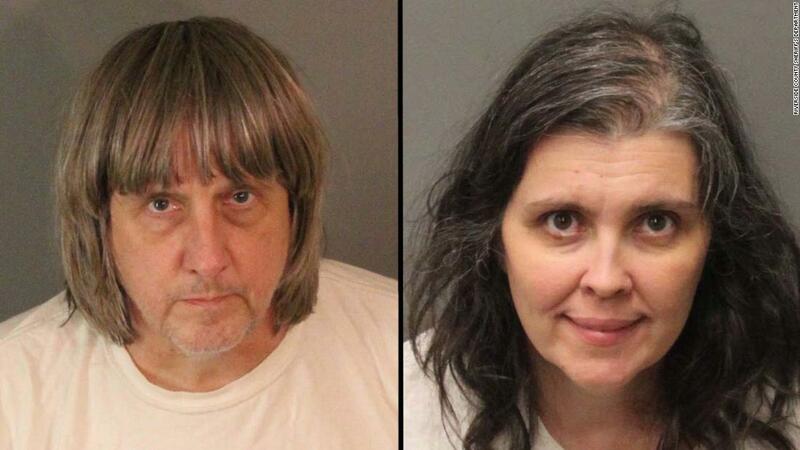 David Allen Turpin, 57, and Louise Anna Turpin, 49, were charged Sunday with torture and child endangerment, the Sheriff’s Department said. The couple was taken to the Robert Presley Detention Center in Riverside. Bail was set at $9 million for each, the Riverside County Sheriff’s Department said. It was not immediately clear if the suspects had attorneys or whether they had entered a plea. The six children — including the 17-year-old who escaped — are being treated at Riverside University Health System Medical Center in Moreno Valley. The seven adults are being treated at Corona Regional Medical Center in Corona, authorities said. Neighbors said they knew a large family lived there, CNN affiliate KABC reported, but they never saw any of the younger children. One neighbor told the station that she saw the parents being arrested early Sunday. The children were taken from the home in their pajamas, she said. “They were very, very pale-skinned, almost like they’ve never seen the sun,” the neighbor said. “And it was mostly girls … kind of small-framed,” the neighbor said. Kimberly Milligan, a neighbor, told CNN affiliate KCAL/KCBS she thought the older children were much younger. “I thought they were like 12 because they looked so malnourished, so pale,” Milligan said. 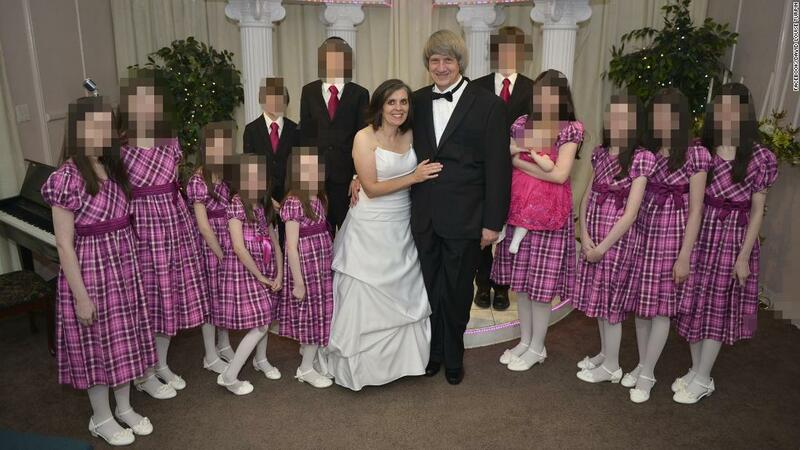 The Turpins moved into the Perris home in 2010, public records show. The next year, they filed for bankruptcy in California, according to court records. Ivan Trahan, an attorney who represented the couple at their bankruptcy hearing, told CNN “there was nothing out of ordinary” about the couple when he worked with them in 2011. They listed about $150,000 in assets, including about $87,000 from 401k plans from Lockheed Martin and Northrop Grumman, according to court papers. The documents listed debts of about $240,000, which included mostly credit card debt and a foreclosed farm in Rio Vista, Texas, valued at $40,000. Trahan said neither of the Turpins seemed upset they were going through bankruptcy. “They came with a lot of debt. We just knew there was no way they could make their payments,” Trahan said. ‘This is a highly respectable family,’ suspect’s mother said. 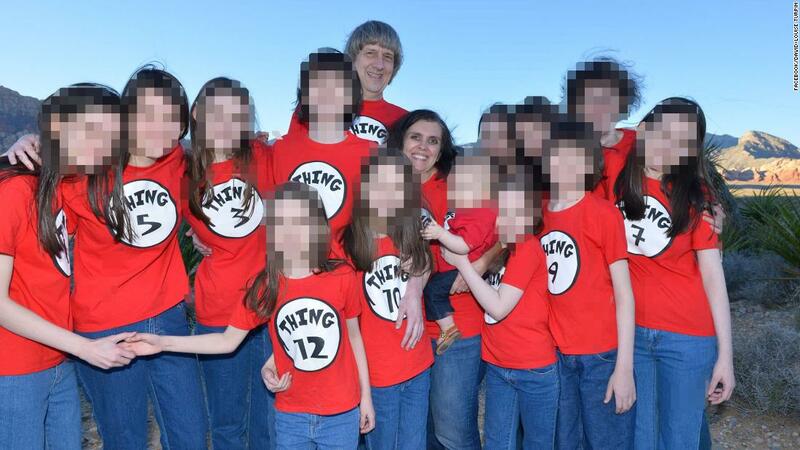 David Turpin’s mother, Betty, told CNN the couple usually took vacations with the entire family in tow. They have 13 children, she said, and they usually dressed alike when they went out for safety reasons. “They were very protective of the kids,” she said. When they went out, the couple would line the children up according to age, and the parents took their positions at the front and back of the line, she said. “It was easier to keep up with the kids” that way, she said. “This is a highly respectable family,” she added. A series of videos on social media showed the couple renewing their vows at the Elvis Chapel in Las Vegas, Nevada. They appear to have renewed their vows several times in recent years, in 2011, 2013 and 2015. In the first video, an Elvis Presley impersonator sang “Love Me Tender” as he walked a smiling Louise Turpin down the aisle to reaffirm her commitment to her husband after 26 years together. The couple’s children joined them for the 2013 and 2015 renewals. In one ceremony, the girls, wearing matching plaid dresses, lead the processional, and the boys, wearing dark suits, stand with their father. An emotional David Turpin can be seen repeating his vows in the video. The children laugh along with the Elvis impersonator, and the couple kisses as their daughters clap. CORRECTION: This story has been updated to give the correct spelling of Northrop Grumman.